The World's Loudest Month—created by AEG Live and Danny Wimmer Presents—continues to break records with its U.S. festival series featuring the biggest names in rock music performing in eight distinct U.S. concert atmospheres in April and May. Billboard's Ray Waddell wrote, "…nowhere is heavy music making more noise than in the festival sector" (May 20, 2016). The World's Loudest Month demonstrated this, as overall attendance surpassed 470,000 for the 2016 series of events held during five consecutive weekends. Attendance increased more than 10% from last year's 426,000 fans, further confirming the growth of rock audiences. The sixth annual Monster Energy Welcome To Rockville was the festival's best offering yet, with more than 50,000 in attendance for the sold-out weekend, marking the biggest rock experience in Florida's history and the third year in a row that tickets were sold out. The festival featured more than 45 bands on four stages, including rock icon/filmmaker Rob Zombie, Disturbed, Shinedown, Five Finger Death Punch, A Day To Remember, Bring Me The Horizon and many more. In addition to enjoying two days of nonstop rock, attendees quenched their thirst and satisfied their hunger with Monster Energy Welcome To Rockville Tequila World Presented by El Jimador, Gourmet Man Food, craft beer selections, and the Jack Daniel's Whiskey Row Experience. Monster Energy Fort Rock expanded to two days in 2016 after selling out the single-day festival at JetBlue Park for three years in a row. South Florida's Biggest Rock Festival had 23,000 in attendance this year. Festivalgoers enjoyed a hot and sunny weekend full of performances from rock icon/filmmaker Rob Zombie, Disturbed, Shinedown, Five Finger Death Punch, A Day To Remember, Bring Me The Horizon, Megadeth, 3 Doors Down, Sixx:A.M., Lamb Of God, Ghost and more. Monster Energy Carolina Rebellion reached new heights with more than 90,000 in attendance as the festival grew to three days (May 6, 7 & 8) in 2016. With over 60 bands on four stages at Rock City Campgrounds at Charlotte Motor Speedway in Concord, NC — and 12 hours of televised performances and backstage interviews on AXS TV — Monster Energy Carolina Rebellion was a full weekend of nonstop rock for fans in both the Mid-Atlantic and around the country. The 6th Annual Monster Energy Carolina Rebellion marked the launch of the legendary Scorpions' U.S. tour — part of their 50th Anniversary World Tour — with Motörhead's Mikkey Dee filling in on drums. The festival also featured performances from Rob Zombie, Disturbed, Five Finger Death Punch, Shinedown, Deftones, A Day To Remember, 3 Doors Down, Bring Me The Horizon, Cypress Hill, Pennywise, Lamb Of God, plus Rock & Roll Hall Of Famers Lynyrd Skynyrd and Alice Cooper, thrash pioneers Megadeth and Anthrax, and many more. The Mid-Atlantic's Biggest Rock Festival featured the best of today's rock, along with legendary classic artists, playing on four stages, plus a world-class BBQ village and top notch camping facilities. While SiriusXM's Jose Mangin hosted AXS TV's hard-rocking televised coverage, fans at the festival and around the world were able to enjoy the quieter side of Monster Energy Carolina Rebellion with the live streamed Zippo Acoustic Sessions hosted by Alternative Press. The archived Zippo Acoustic Sessions can be viewed at the Alternative Press Facebook page (www.facebook.com/altpress) and the Monster Energy Carolina Rebellion Facebook page (www.facebook.com/CarolinaRebellion). Northern Invasion jumped to two full days in its second year, with 45,000 in attendance at Somerset Amphitheater. The festival featured some the biggest names in rock—including Disturbed, Rob Zombie, Korn, Shinedown, and many more—on three stages, with expanded campgrounds. In addition, The Road To Northern Invasion Battle Of The Bands, hosted by 93X in Minneapolis, offered one lucky band the chance to play Northern Invasion. Northern Invasion also partnered with Surly Brewing to debut the "Northern Invasion Pale Ale," which was sold exclusively at the festival. For the ninth year in a row, Rockfest—a Kansas City tradition—had 50,000 in attendance for America's largest one-day music festival held at Penn Valley Park in downtown Kansas City. 2016 marked the 24th year of Rockfest, known as THE rock & roll event of the Midwest, with three stages and 12 hours of hard-hitting music, including performances from Disturbed, Seether, Hellyeah, Sixx:A.M., Ghost, Jackyl, Trivium, Sevendust, and more. Other fan perks included an autograph tent and Rockfest Wedding, where guests could tie the knot in front of 50,000 people. Rock On The Range celebrated its 10th year May 20, 21 & 22 — and after a decade of setting the standard for American rock festivals, the crown jewel of the World's Loudest Month shows no signs of slowing down. 120,000 fans from around the globe descended on MAPFRE Stadium in Columbus, OH to witness the first-ever Rock On The Range appearance by Red Hot Chili Peppers and the first live performance of their current single "Dark Necessities," plus epic performances from Rob Zombie, Disturbed and many more. The festival sold out over two months in advance, marking the fourth consecutive advance sell-out for Rock On The Range. The largest and most acclaimed rock festival in the United States featured 60 performances in all, from a lineup also packed with rock royalty such as Deftones, Shinedown, Five Finger Death Punch, Bring Me The Horizon, A Day To Remember, Megadeth, At The Drive-In (one of their first shows since reuniting), Lamb Of God, Sixx:A.M., Pennywise and more, along with rock's hottest developing artists. Special guest Jacoby Shaddix of Papa Roach joined Disturbed on stage for a cover of Rage Against the Machine's "Killing In The Name," and one of the most memorable and emotional moments of the weekend was the triumphant return to Columbus, OH by Vinnie Paul and his incredible band, Hellyeah. Rob Zombie, guitarist John 5, and Papa Roach vocalist Jacoby Shaddix joined Eddie Trunk, Don Jamieson and Jim Florentine on stage in the Rolling Rock Comedy Tent for a special Saturday night "That Metal Show Live" (based on the VH1 Classic show). The Rock On The Range 10th Anniversary Photo Retrospective curated by photographer Rob Fenn gave fans a peek into Rock On The Range's past, from its beginnings as a one-day festival to its evolution into a 3-day celebration of the rock community. With three days of music on three stages, a comedy tent, new art installations, and many onsite activities, Rock On The Range sets the standard for American rock festivals. Rock On The Range truly is "Where Rock Lives." Rocklahoma celebrated its 10th year in 2016 with a record-breaking 70,000 fans. America's biggest Memorial Day Weekend party featured a lineup of the best current rock artists and classic bands, including Scorpions, Disturbed, Rob Zombie, Five Finger Death Punch, Megadeth, Chevelle, 3 Doors Down, Sixx:A.M., Collective Soul, Sebastian Bach, and many more at "Catch the Fever" Festival Grounds, just outside Tulsa, OK. The three-day camping festival featured music on three stages each day, as well as premium onsite camping amenities and unparalleled VIP packages, living up to its motto of "Life, Liberty & the Pursuit of Rock." In addition, the Rocklahoma charity guitar auction raised over $72,000 for local causes. Over 23,000 rock fans came out to party for the fourth year of The Bud Light River City Rockfest at San Antonio's AT&T Park. Disturbed and Scorpions led the music lineup of over 20 bands on multiple stages at the outdoor Memorial Day Weekend rock festival. 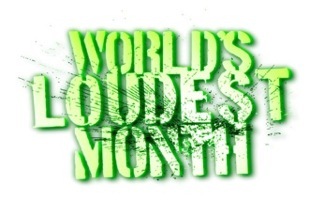 The World's Loudest Month is proud to be sponsored by Monster Energy, Anheuser Busch, Zippo and Jack Daniel's.